Today’s special offer for Access All Areas members is a giveaway of coding services from PSD2HTML. They provide fast, high quality conversion of graphic web design into HTML and its extensions, as well as custom development services for a variety of CMS and eCommerce platforms. Three prizes of $400, $300 and $200 worth of services are up for grabs to allow you to have your own designs hand crafted into beautiful HTML code. Whether your design is a PSD, PNG, AI or even existing HTML markup, PSD2HTML will work their magic to produce high quality, cross-browser compatible HTML5/CSS markup. Require more than a basic HTML page? 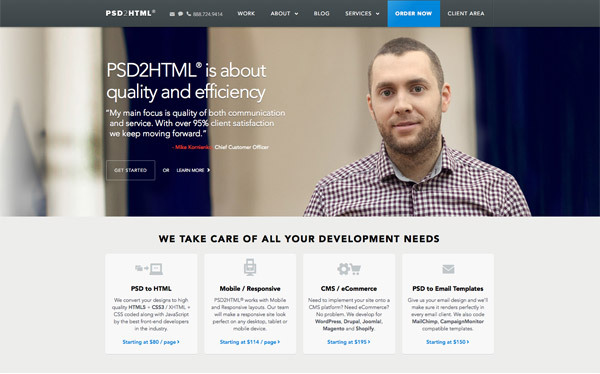 PSD2HTML also cater for many popular content management systems including WordPress, Drupal, Joomla and Magento as well as services that cover PSD to Responsive Design and PSD to Email Template to really save you time. PSD2HTML have kindly arranged a giveaway of $400, $300 and $200 worth of services for Access All Areas members. To be in with a chance of winning simply add your comment to this post giving a brief insight into how you would put the PSD2HTML service to use. The 3 winners will be drawn at random on Friday 21st March 2014 and notified by email. Congratulations to Robin, David and Jimmy who were all drawn out as winners of PSD2HTML coding services! I have a few really great PSD templates already designs, which I would like to transform to HTML websites. I am a web designer and this service would be an immense help for me and my company! This is perfect timing! We’re currently re-building our old website which is long overdue for a major re-design and one of the pages we’re having trouble with is our shop page. Getting a company that could tweak it for us would be a major obstacle overcome for 2014! Thanks for arranging this opportunity Chris! I’m in the midst of creating my own e-business site and would really love for the end result to be coded. Can’t wait for the draw! Would make life so much easier! This would be amazing. Thanks for the opportunity to win! I wanna make a page for my band ^^ so i will use it there ! Never have used a psd to html service. Would be a good trail case to try. I am currently refreshing some of the web sites I maintain. This would help me greatly in that effort. I’m currently using a theme for my personal site… I would love to create a custom design/theme and share it. God! That giveaway would really give me a boost to finally ditch Behance and put together my own portfolio website. Looking to improve my site with my own design. Great deal, Chris and PSD2HTML. This product will definitely help out someone (such as myself) with very basic web understanding! I would love to give this a shot. Been wanting to design a site for a bit. This would be fantastic! I’ve been really needing to amp my upstart business and not having enough time to give it that glimmer! Trying to get a Jewelry website properly HTML-d but unable to. So this is a chance to get it done in much, much better way and also learn from it. I wish and hope I get this win. I have a new project coming up. This gift will come in handy if i win it. Thanks in advance! Ima take the PSD and turn it into Kanye website. This would seriously help me so much to take my personal website that STEP UP in the design world as I don’t have any money as a student….. I would love to revamp our site as well as rework my portfolio site! I’m currently using weebly since it’s so simple but eventually would like a high end site along with pushing my caricature business! Great work on your sites, found some really useful stuff here.